As we know, the physiological signals have very low amplitudes. In all cases, the common mode noise will affect the measurement accuracy. Due to the effect of common mode signals the bioelectric amplifiers cannot distinguish the artifact (noise signal) from the original signal. Also the stray leakage paths can increase the input currents and decrease the input resistance unless we use a guard at the inputs. A schematic representation of input guarding is shown in figure. So we use the method of input guarding. Actually the main aim of input guarding is to avoid the effect of common mode noise. Guarding is used to reduce parasitic leakage currents by isolating a sensitive amplifier input from large voltage gradients across the PC board. 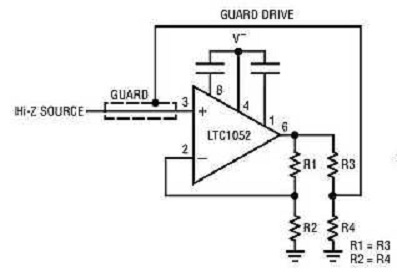 The guard is a conductive PC trace surrounding the input terminals or in physical terms it is a low impedance conductor that completely surrounds an input line or node. It is biased to a potential equal to the line's voltage. Common mode noise occurs because of the unbalance in potential at the inputs. So by placing the shield at the common mode signal potential, the common mode noise can be rejected. Also the guard ring connects to a low impedance point at the same potential as the inputs. The stray leakages are absorbed by the low impedance ring. The equal potential between ring and inputs prevents the input leakage currents. The exact technique for guarding depends on the amplifier’s mode of operation, i.e., whether the input is inverting or a non-inverting type.